A baksu holding a gut. The Isanmyo, a Sinist shrine built in 1925 to worship the four holy kings Dangun, Taejo, Sejong and Gojong. It is one of the few surviving shamanic temples in Korea. Grounds of the Samseonggung, a shrine for the worship of Hwanin, Hwanung, and Dangun. 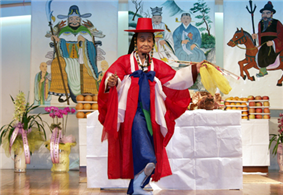 Korean shamanism, also known as Muism (Korean: 무교 Mugyo "mu [shaman] religion") or Sinism (신교 Singyo "religion of the shin (hanja: 神 ) [gods]", is the ethnic religion of Korea and the Koreans. Although used synonymously, the two terms aren't identical: Jung Young Lee describes Muism as a form of Sinism - the shamanic tradition within the religion. Other names for the religion are Sindo (traditional Chinese: 神道; ; Korean: 신도 "Way of the Gods"), Sindoism (traditional Chinese: 神道敎; ; Korean: 신도교 Sindogyo "religion of the Way of the Gods"),[note 1] Gosindo (traditional Chinese: 古神道; ; Korean: 고신도 "Way of the Ancestral Gods"),[note 2] and Pungwoldo (hanja: 風月道 "Way of Brightness"). [note 3] It has approximately 5-15 million followers. In contemporary Korean language the shaman-priest or mu (hanja: 巫 ) is known as a mudang (hangul: 무당 hanja: 巫堂 ) if female or baksu if male, although other names and locutions are used. [note 4] Korean mu "shaman" is synonymous with Chinese wu, which defines priests both male and female. The role of the mudang is to act as intermediary between the spirits or gods, and the human plain, through gut (rituals), seeking to resolve problems in the patterns of development of human life. Central to the faith is the belief in Haneullim or Hwanin, meaning "source of all being", and of all gods of nature, the utmost god or the supreme mind. The mu are mythically described as descendants of the "Heavenly King", son of the "Holy Mother [of the Heavenly King]", with investiture often passed down through female princely lineage. However, other myths link the heritage of the traditional faith to Dangun, male son of the Heavenly King and initiator of the Korean nation. Korean Muism has similarities with Chinese Wuism, Japanese Shinto, and with the Siberian, Mongolian, and Manchurian religious traditions. As highlighted by anthropological studies, the Korean ancestral god Dangun is related to the Ural-Altaic Tengri "Heaven", the shaman and the prince. In some provinces of Korea the shaman is still called dangul dangul-ari. The mudang is similar to the Japanese miko and the Ryukyuan yuta. Muism has exerted an influence on some Korean new religions, such as Cheondoism and Jeung San Do. 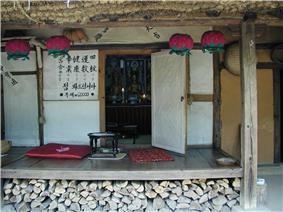 According to various sociological studies, many Christian churches in Korea make use of practices rooted in shamanism. The Korean word mu is thought to come from the same root as the Chinese wu, defining a shaman-priest of both sexes. The Korean language and culture, however, has developed its own terminology: already in Yi dynasty records, mudang is used prevalently instead of mu. Also mudang apparently derives from Chinese, and originally meant the "altar [or shrine] of mu" and not the person itself. A different etymology explains mudang as stemming directly from the Uralo-Altaic term utagan or utakan, for Central Asian female shamans. The Korean word 'Mu" means "Heaven" of Mago(Samshin, Trinity god) land. The priest for Mu (Heaven) is Muin(巫人) of Shaman. Man in Shaman is the meaning of the muin (man) of Suri(one of Trinity). Mudang is used mostly for female shamans, though not exclusively. Male Korean mu are called by a variety of names, such as sana mudang (literally "male mudang") in the Seoul area, or baksu mudang, also shortened baksu ("doctor", "healer") in the Pyongyang area. It is reasonable to believe that baksu is an ancient authentic designation of male shamans, and that locutions like sana mudang or baksu mudang were formed because of the prevalence of female shamans in recent centuries. Baksu may come from a Korean adaptation of Ural-Altaic names for male shamans, such as baksi, balsi or bahsih. Mudang is not the person of shaman. Mu means "Heaven" and the respect for Heaven. It's a ritual of religious customs from the ancient Korea of Han Nation. Dang is considered as Dangun (King of Dan Nation) or Tenguri (Heavenly King from the Heaven, Hevenly King or God), but Dang(堂) is the place where the Heavenly God (天神) landed in the earth at the first time. It is memorized as Big Tree of Wongsang, which is meaning of God coming place and Tree (神壇樹), that is the meaning of "Life Tree" in Bible. Therefore, Mudang is the respect for the place Heavenly God was landing on the earth. The Dang is the secret place of God and symbol of the Korean traditional belief system for over 6,000 years. It is the God Palace for Trinity God from the Heaven Land. The Ural-Altaic origin of Muist terminology is more reasonable than other theories pointing out a Chinese origin, since the Chinese culture influenced Korea in a later period than that when the origins of the latter can be traced. Koreans adopted the Chinese characters in historical times filtering their previously oral religious culture. The mu is known as "magician, medicine man, mystic and poet" (Eliade, 1974). What set him apart from other healers and priests is his ability to move at will into trance states. During a trance, the shaman's soul leaves his body and travelled to other realms, where helping spirits guide him in his work. The mu provides healing on many levels: physical, psychological and spiritual. The work of the mu is based on the holistic model, which takes into consideration, not only the whole person, but the individual's interaction with his environment, both his inner and outer world. The soul is considered the place of life breath, where a human's essence (life energy) resides, and any physical illness is inextricably linked with sickness of the soul. Illness of the mind has its origins (root cause) in soul loss, intrusion or possession. The gut, rites of the Korean mu, have gone through a number of changes through the Silla and Goryeo periods. Even during the Joseon, which was heavily Confucian, Muist rites persisted. In the past such rites included agricultural rites, such as prayers for abundant harvest. With a shift away from agriculture in modern Korea this has largely been lost, and modern-day mu are more focused on the fulfillment of the spiritual or mundane needs of urban people. Mu can be categorized into two basic institutes: sessǔmu, who inherit the role and the right to perform rites, and kangshinmu, who are initiated into their mu office through a ceremony. Sessŭmu historically were mostly concentrated in the southern part of the Korean peninsula, while kangshimu were found throughout the entire peninsula and contiguous areas inhabited by Koreans, but were mostly characteristic of the north (modern-day North Korea), the contiguous areas of China and the central part of the peninsula around the Han River. The shinbyeong, also called "self-loss", is the possession from a god that a chosen mu goes through. It is said to be accompanied by physical pain and psychosis. Believers would assert that the physical and mental symptoms are not subject to medical treatment, but may only be cured through acceptance of and full communion with the spirit. The illness is characterised by a loss of appetite, insomnia, visual and auditory hallucinations. A ritual called a naerim-gut cures this illness, which also serves to induct the new shaman-priest. In all the myths explaining figuratively the role of the mu, it is implied that they are not self-ordained priests, but they come as media, intermediaries, of the highest forms of being. In other words they are heavenly ordained, as the "Heavenly King" (Haneullim or Hwanin) has a key role in all the myths. Mu is the place of Heavenly King's landing on the earth as Tree (나무, Saint). Mu is the third level gods of Korean myth, which are Bak(Wind God, Heaven), Lang(Cloud, Human) and Mu(Rain, Earth). Three gods of becoming, teaching and ruling are one identifying god (Trinity) originated from Han Peoples' origin. Mu is ruling class and person who prepare the ritual of Heavenly masses. ^ Andrew E. Kim. Korean Religious Culture and Its Affinity to Christianity. Korea University, Sociology of Religion, 2000. ^ Heonik Kwon. Healing the Wounds of War: New Ancestral Shrines in Korea. The Asia-Pacific Journal, Vol. 24-4-09, June 15, 2009. ^ Gosindo is primarily proposed in the Dangunist context. ^ Pungwoldo was first used by Choe Chiwon. ^ Another term is dangol (hangul: 당골 ). The word mudang is mostly associated, though not exclusively, to female shamans due to their prevalence in the Korean tradition in recent centuries. This has brought to the development of other locutions for male shamans, including sana mudang (literally "male mudang") in the Seoul area or baksu mudang ("healer mudang"), shortened baksu, in the Pyongyang area. It is reasonable to believe that the word baksu is an ancient authentic designation for male shamans. The worship of kinship gods and their shrines have been nearly entirely obliterated due to the political disarray of the 20th century, with only few, mostly unused, shrines still surviving. Recently there have been cases of reconstruction of shrines and reactivation of traditional rites in some villages. Jeju Island is a center of Muism. Korean Muist temples are generically called myo (meaning "temple") or gung ("palace", a complex of multiple temples). Historically, the Korean traditional religion also included the institutional worship of the originating gods of a kinship in ancestral temples, the sadang (사당, meaning "shrine"), similarly to the religions of other East Asian cultures. Muist temples are distinguished by the use of the taegeuk symbol on their doorways, and many of them have gates similar to Shinto torii. Since the early 19th century, a number of movements of revitalisation or innovation of traditional Sinism arose. They are characterised by an organised structure, a defined doctrine, and often a holy scripture. The most prominent among these sects are Bocheonism, Cheondoism, Daejongism, Daesun Jinrihoe, Jeungsanism and Suwunism. Muism has experienced a revival in South Korea in most recent times. In North Korea, according to government figures roughly 16% of the population is Muist. The situation severely worsened with the division of Korea and the consequential northern Socialist governments and the southern pro-Christian governments, contributing to a further erosion of the Korean traditional religion. The "movement to destroy the worship of gods" in the 1970s and 1980s, prohibited indigenous worship and virtually wiped out all traditional shrines. This was particularly tough under the rule of Park Chung-hee. In North Korea, all mu descendants were labelled as members of the "hostile class" and are considered to have bad songbun, "tainted blood." During the Japanese rule over Korea, the Japanese showed Muism as backwards in the attempt to replace it with State Shinto. For a brief period in the 1940s, after the demise of the Japanese rule in the peninsula, the traditional religion became identified with the pure Korean national essence. In the 1890s, the twilight years of the Joseon kingdom, Protestant missionaries gained significant influence, and led a demonisation of the traditional religion through the press, and even carried out campaigns of physical suppression of local cults. The Protestant discourse would have had an influence on all further attempts to uproot Muism. Since the 15th century Joseon, however, things changed with the adoption of Neo-Confucianism as state ideology. Non-Confucian religions were suppressed and Muism was disregarded as backwards. In the late 19th and 20th century, a series of factors have concurred to the destruction of Muism, leading to the dismemberment of the fabric of Korean society, which has ultimately paved the way for the growth of Christianity and Buddhism in Korea. Although many Koreans converted to Buddhism when it was spread to the Korean peninsula in the 4th century, and adopted as the state religion in Silla and Goryeo—leading to the development of Korean schools—, it remained a minor religion in comparison to Sinism. Sinism goes back to pre-historic times, thus it pre-dates the introduction of Buddhism and Confucianism, and the influence of Taoism, in Korea. It is similar to the Wuism of China. 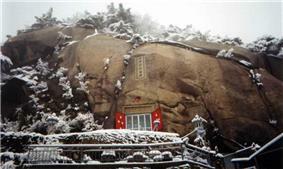 Vestiges of temples dedicated to the utmost god Haneullim as well as other gods have been found on tops and slopes of many mountains in the peninsula. Jeomjip, fortune telling house managed by a mudang. 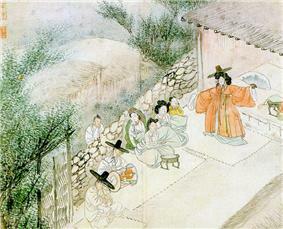 The depiction of a mudang performing at a gut in the painting entitled Munyeo sinmu (무녀신무, 巫女神舞), painted by Shin Yunbok in the late Joseon (1805). The communion between ancestors or gods and men takes place through a cup of purified wine, called bokjan or "cup of blessings". Also the color white, extensively used in rituals, expresses purity. The purification of the body is performed through burning white paper. Important to the gut, and Sinism in general, is purity of both the body and the mind. It makes genuine and efficacious the communion of people and ancestors. Ritual purification of the altar takes place before the start of the gut, and again as part of the first gori through fire and water. Many elements of the gut develop in a three-fold pattern (for example, dances repeated three times). Threefoldedness has important meaning in Sinism, for it signifies completion or fulfilment of the beginning; a three-time repetition of an action means to complete the initial intention. The meaning of this aspect is grounded in the theological concept of the trinity of being—Hwanin, Hwanung, Dangun—, the three stages of manifestation of Haneullim. A gut is a crossroads of three elements: the gods, the believers who pray to them, and the mu mediating between the two. There are different types of gut, varying from a region to another one. The unfolding and style of the Muist rite depends largely on the objective of the ceremony. The individual character and abilities of the mu bring a unique character to the respective ritual to be performed. Through singing and dancing the mu begs the gods to intervene in the fortunes of men. The shaman wears a very colourful costume and normally speaks in ecstasy. During a gut a shaman changes his or her costume several times. 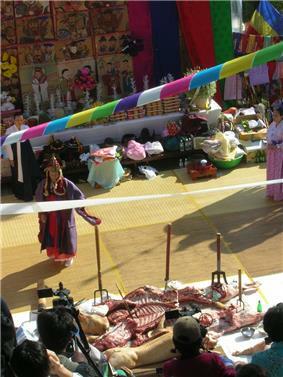 Gut are performed through a number of ceremonial phases, gori. The gut or kut (굿) is the ritual performed by Korean mu, involving offerings a sacrifices to the gods and ancestor worship, rhythmic movements, songs, oracles and prayers. These rites are meant to create welfare, promoting commitment between the spiritual and the mundane world. The main varieties of the gut are naerim-gut, dodang-gut and ssitgim-gut. Famous mudang holding a five-day long gut performance in rural Korea, in October 2007. Dangun, the "Sandalwood King", is the god of the Earth. As Sansin, the "God of the Mountain", he represents the center of the cosmos reaching up to Heaven. Where the heavenly princely lineage was incarnated, the "cosmic mountain" was formed, and the sandalwood became the "holy tree", all aspects fundamental to the shamanic experiences as Mircea Eliade highlights. The concept is also explained in terms of Hwanin the God-Father creator of the universe, Hwanung the God-Teacher or the order of nature, and Dangun the God-King, the human king who directs the kingdom according to the natural order, making well-being. Sinist theology contains a triune idea of God in the myth of Dangun, the third form of Hwanin. With Dangun as Sansin, the godly trinity of the Korean religion represents three generations of Haneullim, the Heavenly King. Hwanin represents the transcendent source, with "haneul", "hwan" indicating "being" or the "Heaven", and "im", "in" the cause of it. Hwanung, second form of Hwanin, is the god of the middle realm; he occupies the central realm between Heaven and Earth. This belief is unquestionable for the mu as they view their works as ordained by him. Scholars say that this belief is the heart of all religions in Korea, and it is deeply rooted in the mind of the Korean people. Haneullim etymologically means "source [im, in] of all being [haneul, hwan]", indicating the fountain of the universe, God, the supreme being, the supreme mind. Haneullim ("Heavenly King"), also spelled Hanalnim, Hananim, Hanunim, Hwanin (in the Dangun myth), also called Sangje, Sangjenim ("Highest Emperor") or simply Haneul ("Heaven") or Cheon ("Heaven", in Sino-Korean), or Cheonsin ("God of Heaven"), is the core of the Korean national faith. Dangun was the first name maker of mu, intermediary between the human plane and Haneullim or "Hananim", to whom he worshipped and prayed on the behalf of his people. Also the importance of the worship of other ancestors and gods is a mean of communion with the fountain of the universe, Haneullim. The name Dangun might be derived from the Ural-Altaic Tengri; in some provinces of Korea the shaman is still called nowadays tangur tangur-ari (also tangol, 당골). Later in the myth Dangun becomes the Sanshin (山神), the "God of the Mountain" (of growth, prosperity). Various Dangunist movements, worshipping primarily Dangun, have been founded. Ungnye's wish was appreciated, so that she became the queen and gave birth to a prince who was given the royal name of Dangun, the "Sandalwood King". Dangun reigned as the first human king of Korea, giving the kingdom the name of Joseon, "Land of the Morning Calm". At the time of his reign, Ungnye or Ungnyeo (웅녀, 熊女) the she-bear bear and a tiger were living in a cave near the humans, praying earnestly that their wish to become human might be granted. Ungnye patiently endured weariness and hunger, and after twenty-one days she was transformed into a beautiful woman, while the tiger ran away for it could not tolerate the effort. The woman was overjoyed, and visiting the sandalwood she prayed that she might become the mother of a child. The myth starts with prince Hwanung ("Heavenly Prince"), son of Hwanin. The prince asked his father to grant him government over Korea. Hwanin accepted, and Hwanung was sent to Earth bearing three Heavenly Seals and accompanied by three thousand followers. The prince arrived under the holy tree of sandalwood (Shindansu 신단수, 神檀樹) on the holy mountain, where he founded his holy city. In Korean myth, Dangun is the descendant of Hwanin, the "Heavenly King" and initiator of the Korean nation. Some have claimed that this myth is older than that of the mother goddess, although this seems unlikely if such a mother goddess is indeed what is represented by Paleolithic statues of female forms (a controversial possibility). Accounts similar to the Dangun myth are found in Ainu and Siberian cultures. In the north of the peninsula the princess is known as Chil Kongju (the Seventh Princess), seventh of the daughters of the king. The myth tells that she was rejected by her father, who sealed her in a stone coffin and cast it in a pond, but she was rescued by a Dragon King sent by the Heavenly King, and ascended to the western sky becoming the goddess of healing waters. Names in other provinces include Pali Kongju and Kongsim. In the tradition of Jeju Island, where there are more male baksu than female mudang, the myth of the origins tells of a prince as the ancestor of all mu. The myth of the princess is the most popular, and it differs from a region to another. In one of the versions the princess is Ahwang Kongju of the Yao kingdom on the Asian mainland or another kingdom. The princess had a strong connection to the Divine, granting welfare to her people. The king sent the princess among the people, who began to worship her for her healing powers. The mudang were established as her successors. 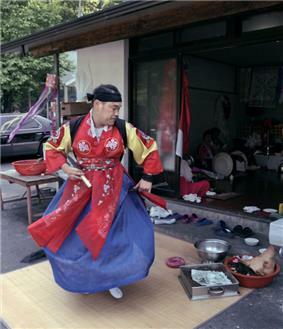 The princess is worshipped at the ritual of seasonal offerings in Chungcheong. The yellow and red clothes worn by the mudang are regarded as Ahwang Kongju's robes, at the ritual. The myth of the mother goddess usually tells of a man, Pobu Hwasang, who encountered the "Holy Mother [of the Heavenly King]" on the top of a mountain. The Holy Mother became a human being and married him, giving birth to eight girls, the first mudang. According to philological studies, this myth was formed in the Unified Silla period, when Buddhism and influences from China had already entered the Korean peninsula. In a collection of myths, the origins of the mu or mudang are linked to a mother goddess associated with a mountain. She has different names according to different regions and mountains associated: Sungmo ("Holy Mother"), Daemo ("Great Mother"), Jamo ("Benevolent Mother"), Sinmo ("Divine Mother"), Nogo ("Ancient Lady"), and others. In other myths she is a princess who is later transformed into a goddess. A shrine on Mount Bukhan in Seoul, South Korea. myths.Siberian is a significant symbol in Korean myth, also found in bear The  or painful experiences.tragic and ,holy tree and the cosmic mountain such as the divine presence of symbols Further features are  often a lineage that can be traced to kingly founders of civilisations.